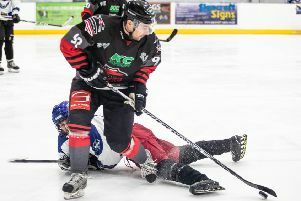 Murrayfield Racers took a huge step towards the Scottish National League Cup final with a dominant 6-0 win in the home leg of their semi-final tie with Kirkcaldy Kestrels at Murrayfield tonight. Racers’ forward line of man-of-the-match Sean Donaldson, hat-trick hero Joel Gautschi, and Michael Ireland combined for five of the team’s six goals, a performance that drew praise from director of hockey, Tony Hand. 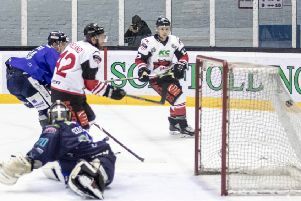 Racers had the majority of the play in the opening period and were especially dangerous on the power-play, out-shooting Kirkcaldy 12 to three. They opened the scoring with the man advantage, Gautschi tipping-home an initial Patriks Grigors one-timer from the blue-line at 16 minutes and eight seconds. Kestrels enjoyed one of their best attacking spells at the mid-way point, only for a timely poke-check from Racers keeper Mark McGill which lead to a Ross Borwick break-away goal to make it 3-0 for the home side. Ireland scored Racers’ fourth in the 38th minute. The final period was far more end-to-end with Racers edging the shot count 13 to 11. Donaldson tipped a powerful Rihards Grigors slap-shot beyond Kirkcaldy goalie David Jackson in the 48th minute. Murrayfield pushed hard right to the final whistle with Gautschi completing his hat-trick with a fine finish from the slot with just 25 seconds remaining. A delighted Hand said: “Kirkcaldy worked us hard, we had to grind them down, and eventually we out our goals. I thought Kirkcaldy played well actually, Mark McGill made some huge timely saves for us when we were three up to stop them getting back into the game. It was an all round good performance from everyone.